Thought Center: Eyjafjallajo...KULL THE CONQUEROR!!! On Saturday, this was a tiny snippet in BBC and a tiny one liner in the papers. That such a blink-and-you'll-miss-it piece of news could bring 27000 flights a day to a grinding halt, cripple an already debilitated airline industry, strand passengers all over the globe, give the jitters to anyone traveling towards that part of the world, was unimaginable to say the least! 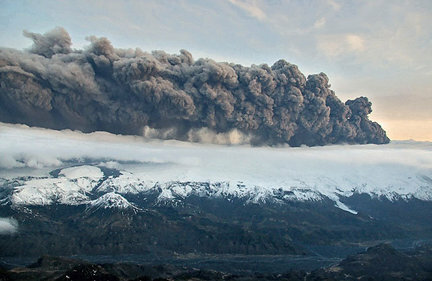 The other day, I was telling a friend about this volcano that has erupted in Iceland. I typed out the name to her - Eyjafjallajokull. Her response was - 'Please turn the webcam towards the kid who's playing with your keyboard!' Yup. No one knew about this poor volcano till date. I never knew volcanoes existed under the ice in a country called ICELAND! But now I know. And I know so very well, that I could never forget it even if I so wished! So, ***** Kull the conqueror, as I'd rather call it, has managed to throw a whole world into disarray. Several things are coming to the fore thanks to this volcano. One - Europe is still the center of the world. The other day, I was stuck at a level crossing in Mumbai. I was on the road and the gates were lowered to signal the arrival of a train. To get to my destination, I had to cross those railway tracks and move on. While I waited, anxiously looking at the watch, knowing I was running 20 minutes late, I kept looking at the tracks. Almost 7 trains went past in quick succession. And I wondered - Had I not been standing here, I never would have realized the fact that so many trains ply on that line! Likewise, it takes a volcano to realize that 27,000 flights ply the European airspace per day! Even though Africa is not too far away from Europe, it is almost unimaginable to think of Dubai airport supplanting Heathrow, let alone Entebbe or the airport of Cote d'Ivoire! Second, a non-third world passport is a boon in such a case. I saw a small report on BBC today, where a correspondent on holiday somewhere in Europe. Hearing about the volcano, he tried to go via road back to London. Not being able to rent a car there, he crossed the border to the neighboring country and hired a car there and drove down to Barcelona, from whence he spoke to BBC! I can only imagine what would happen to someone holding an Indian passport being stuck in Heathrow. I guess the maximum that can happen would be that the BA guys, out of goodwill could let the passengers to go on a transit visa to an airport hotel. Maybe some may not be given that advantage either! As an Australian friend remarked one day, his passport was of use in traveling, without a visa in Europe, North America and a greater part of LatAm, since it was a valid ID. His Indian wife's passport on the other hand, was of precious little use. So, any Europe - wide travel plans he may have had were pitifully scuttled by the prospect of having to stand in never-ending queues for his wife's visas!!! So Kull has taught us a lot. And now that the lessons are over, I sincerely wish Kull cools down and let's the planes fly.